TVF Play is a great video website which aims at getting rid of the same old entertainment on TV. You can find many interesting and original videos here. It is reported that TVF Play has over 8 million total subscribers on April 2018. Considering you may have several apps in your Android to watch videos, such as YouTube, Facebook, Instagram, TVF Play etc., you may be looking for an app that can download video & music from all of them since as we know, all those websites don’t support videos or movies download. If you have the same demand, this article will be hopeful for you. Here is an instruction telling you how to download video and music from TVF Play with InsTube, which is a great video & music downloader. 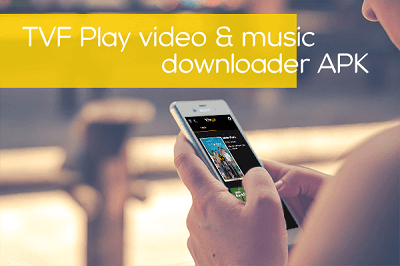 What Is the Best TVF Play Video & Music Downloader? InsTube is a free video & music downloader for Android on which you can save videos and music from over 40 sites, like YouTube, Instagram, and TVF Play. In addition, it combines the high-speed of the network with the privacy function to provide a fast and safe place to download your favorite videos and music. Once you lock the video, it is virtually impossible for others to see it without entering the password you designed for it. 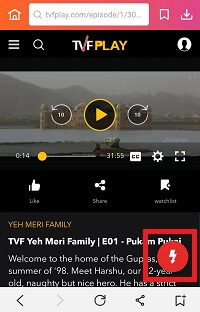 Since TVF Play is a website included by InsTube, it is your best choice if you are looking for the TVF Play video downloader for Android. Before you start to download video & music within InsTube, you need to install InsTube to your Android. The easiest way is to click the download button below to install it. If you have any problem, there are concrete instructions telling you how to do that. Now, follow us to see how to download TVF Play music and video using InsTube. Step 1: Open InsTube and find TVF Play on its homepage. Tap on TVF Play to enter its website. Then, search for the video you want to download in the search box, and then tap on that video to play it. Step 2: A red download button will appear on the bottom right corner of your Android. Tap on that button to download your video. Step 3: Before the download starts, you can choose the format on the pop-up page. InsTube provides many formats for the users to choose from, like MP3, 3GP, MP4(in different resolutions), etc. After that, tap on the “Fast Download” button to start the download. Step 4: The video is being downloaded now. Tap on the download icon and enter “My Files” to check it. Your video & music will be saved here. You can download as many videos & music as you want in this way. InsTube allows you to download many videos or songs at the same time. 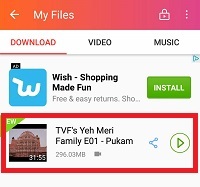 Now start to download TVF Play music and videos. If you have any problems or concerns, welcome to contact us on support@instube.com. Top 6 Ways to Download Videos from YouTube, Vevo, Vimeo, etc.